What is the Plasma Process? The Plasma process is accomplished through the use of a low pressure, RF induced gaseous discharge. The material or specimen is loaded into the reaction chamber. The chamber is evacuated to a vacuum pressure of 0.1-0.2 torr by a mechanical vacuum pump. A carrier gas is introduced into the chamber, raising the chamber pressure to 0.3-1.2 torr, depending on the application. RF Power is applied around the chamber (13.56 MHz). This excites the carrier gas molecules and dissociates it into chemically active atoms and molecules. The mechanism employed in this process is one of ionization. The combustion products, which are completely dissociated and harmless are carried away in the gas stream. The unique property of this process is that it occurs near low temperatures without employing toxic chemicals. Ashing of biological material, food stuffs etc. A plasma is a partially-ionized gas consisting of equal numbers of positive and negative charges and a different number of unionized neutral molecules. When a gas is subjected to a DC or radio frequency (RF) potential at reduced pressure this is usually accompanied by glow, which is known as glow discharge. The words glow discharge and plasma tend to be used synonymously, although glow discharges are not perfect plasmas - but for the purposes of this text they will not be differentiated. The characteristic glow of these plasmas is due to electronically excited species producing optical emission in the ultraviolet or visible regions of the spectrum and is characteristic of the composition of the glow discharge gas. For example, argon gives a bright blue color and air or nitrogen gives a pink colour that is due to excited nitrogen molecules. Exposing a gas to the RF potential at reduced pressure creates a plasma which contains active species - for example, in the case of oxygen, atomic oxygen. Oxygen atoms will oxidize organic molecules more readily than oxygen molecules. So typically a cellulose material can be converted to carbon dioxide, carbon monoxide and water at room temperature, rather than at elevated temperatures (eg burning) and furthermore the oxidation is more controllable. 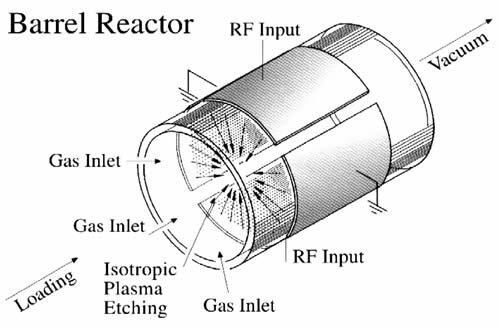 There are many types of reactors available. They are all glow discharge systems but vary considerably in terms of excitation frequency (5kHz - 5GHz), operating pressure (1mbar - atmospheric pressure) and electrode arrangement. In addition to barrel systems there are parallel plate reactors; these usually consist of a grounded plate onto which the specimens are placed and an insulated parallel plate to which the RF power is applied. The reverse of this arrangement where the specimens are placed on the non-grounded electrode is generally known as ‘Reactive ion etching’ (RIE). Etching in this type of reactor is inherently directional, whereas the former can be both directional (anisotropic) or isotropic. The barrel reactor usually etches isotropically and is favored for most plasma applications. The barrel reactor, as the name implies, is a cylindrical container, which can be evacuated. The RF power, usually at 13.56MHz frequency is applied to the system via internal or external electrodes by capacitive or inductive coupling. This type of reactor is used for the plasma ashing process and also for the plasma etching process, although the disadvantage in the latter for some users is that the process is not completely isotonic so that undercutting can occur.